ADATA recently launched two new solid-state drives (SSDs): one it claims is the fastest and smallest external SSD, and the other is a new 2.5-in laptop SSD based on 3D NAND. Here, I review ADATA's diminutive external SSD as 2.5-in. At just 2.8-in x 1.7-in x 0.4-in, the ADATA SE730 SSD is not just shirt-pocket friendly, it can practically disappear in your pants pocket among your smartphone and keys. It also comes in a stylish, gold- or red-colored metal case. 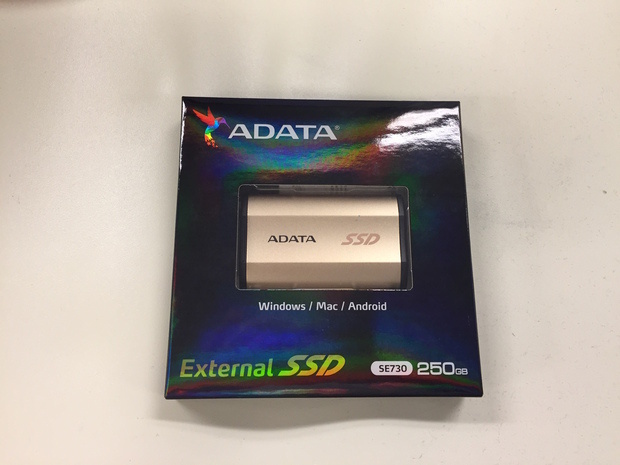 ADATA's SE730 external SSD in its packaging. The ADATA SE730 SSD uses the USB 3.1 Gen 2 specification (also referred to as SuperSpeed USB 10Gbps) with a reversible Type-C connector. ADATA claims its SSD can support up to 550MBps read and 450MBps write data transfer speeds. That should mean a 5GB file, the size of a typical HD movie, would take 16 seconds to transfer. The SE730 SSD comes with a USB Type-C-to-USB Type-A cable, but connection to a Micro USB Type-C plug requires a separate cable (not included). In addition to being stylish, when the attached USB port cover is closed, the drive is both dust proof and water proof up to a depth of about five feet of water for up to an hour; that means it meets the IP68 device protection standard. This is a huge plus in its column, as most SSDs are not waterproof. Additionally, the SE730 is MIL-STD-810G 516.6 shock-proof certified, which means it can sustain a drop of up to four feet onto a hard surface. Oddly, ADATA's SE730 only comes in one capacity: 250GB. ADATA explained that the printed circuit board "is very small and the 250GB capacity is the largest that we can arrange" using two-dimensional (planar) NAND flash. "If we put 3D NAND inside in the future, it will definitely have larger capacity," a spokesperson explained via email to Computerworld. The ADATA SE730 SSE retails for $150, and comes with a three-year warranty. Capacity aside, ADATA claims its new SSD can reach read/write speeds of up to 500MBps, which is pretty much as fast as you'll ever find in a consumer-grade, external SSD. As I typically do, I started my performance benchmark tests using Blackmagic Design Disk Speed Test 3.0, which measures the read and write performance of storage media in video frame rates and formats. Those metrics provide accurate measurements of how a mass storage device will perform with video-related applications. 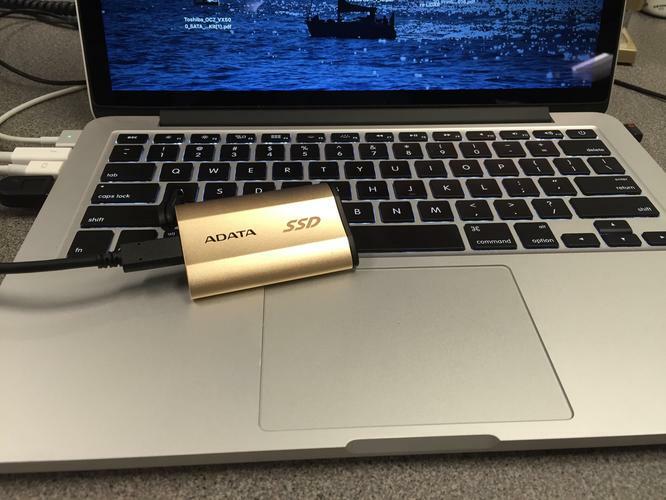 The ADATA SSD was connected to an Apple MacBook Pro running OS X El Capitan (v. 10.11.6) with 8GB of RAM and a 2.5GHz Intel Core i5 processor. The SE730 is compatible with Windows, macOS and Android, so it can be used for cross-device content sharing. The SSD was clocked by Blackmagic as having up to a 424MBps read speed and a 378MBps write speed. For an external drive, that's remarkably fast, albeit slower than ADATA's specification claims. For my next performance test, I transferred a 4.29GB HD movie, Guardians of the Galaxy; the transfer took 13.35 seconds, which was pretty much spot on what ADATA claimed its SSD could do. My last performance test consisted of transferring a 10.27GB file folder consisting of 1,524 jpeg photos; the transfer took 41.21 seconds. 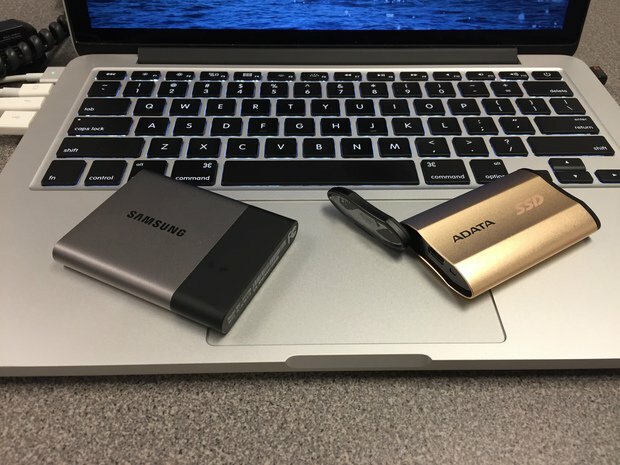 The ADATA SE730 (right) could not match the speed of the Samsung T3 external SSD, though ADATA's drive is more rugged. How does the ADATA drive compare to other external SSDs? I chose one of my favorite SSDs for comparison: the Samsung T3 SSD. While the T3 comes in 250GB, 500GB, 1TB and 2TB capacities, it also uses the USB-C type connector and the USB 3.1 specification, so it's a suitable comparison. The Samsung SSD is also only slightly larger than the svelte ADATA SE730. The Samsung, however, weighs 1.8 oz. compared to the ADATA's 1.1 oz., but the difference really isn't noticeable in your pocket. The Blackmagic benchmark software showed that the Samsung T3 SSD had a maximum read/write speed of 432MBps and 409MBps, respectively -- a bit faster on reads, significantly faster on writes than the ADATA SE730. When it came to actual data transfers, the Samsung drive handily beat the ADATA SE730; uploading Guardians of the Galaxy took 10.27 seconds, more than three seconds faster than the ADATA SSD. My 10.27GB file folder of photos took the Samsung T3 26.96 seconds to upload, a whopping 14 seconds faster than ADATA's SSD. At first, I was puzzled how the Samsung SSD could be that much faster. One explanation is that my particular Samsung T3 is a 1TB drive; the greater the capacity, in general, the better the performance. That's because a higher capacity drive has more "elbow room" in which to move data around. Two new SSDs, however, should be similar in performance. That's because until an SSD has sustained a full capacity worth of writes, meaning 250GB of data has been written to the ADATA drive (or 1TB to the Samsung) over time, neither one has to perform any program-erase (P/E) cycles. I know for a fact that the Samsung has had many terabytes written to it and erased since I've owned it. In short, the drives should have similar performance. Another reason Samsung's drive offers superior performance is that it's built using 3D NAND flash memory, which Samsung calls V-NAND (vertical NAND). Three-dimensional NAND, which is offered by all the major SSD vendors today, increases density by stacking NAND flash cells vertically like microscopic skyscrapers. The T3 uses Samsung's 48-layer V-NAND, which offers vastly denser storage over previous planar (2D) NAND products. By stacking cells vertically, Samsung avoids having to further shrink the NAND's circuitry to fit more capacity and avoids the additional error correction software that would slow performance. While ADATA uses 3D NAND in its new SU800 512GB 2.5-in laptop SSD, the external SE730 uses standard planar (single layer), multi-level cell (MLC) NAND flash. Lastly, the T3 SSD uses Samsung's TurboWrite feature, which creates a high-performance write buffer to which new data is first written, and comes with native AES 256-bit hardware encryption. That last feature enables strong data protection via passcodes. ADATA's new SE730 SSD may not be as fast as Samsung's T3 SSD, but it is smaller and lighter. And while it does not have native encryption, it is rated as waterproof and shockproof to military standards. If looks matter, the SE730 comes in a more stylish gold case compared with Samsung's minimalistic gray-and-black façade. As for pricing, Samsung's 250GB T3 (initially $130) goes for just $99 on Amazon. Given the ADATA drive's $150 retail price, at least in the near-term you'll pay a premium for durability. While I'd personally choose capacity, performance and pricing over a waterproof and more shockproof SSD, ADATA has indeed produced a rugged, good-looking device that is a top performer for an external SSD. It wasn't too ago that top-ranked internal SSDs struggled to match this SSD's performance. Whether that ruggedness is worth the trade-off in capacity, price and performance depends on your needs.